One thing that I’ve learned in food and cooking is that there are no hard and fast rules to follow. Sure, there are certain foods, particularly in baking, that really rely on following a certain set of guidelines and proportions. But within those guidelines there are areas for interpretation. Opportunities to put your own signature on a dish. Cooking, for me, is about creativity. Trying new things. Going outside the norm to find the unexpected. And in this case, it meant me realizing that pesto can be made out of more than just basil and pine nuts. Much more. I’ve chatted with you about before about how we have excitedly joined a CSA this year and with this, the opportunity to eat local, eat healthy and experience new veggies that I’ve typically given the cold shoulder to. We had a few weeks of pea shoots, and the first week I made the impossibly simple yet scrumptious Frittata with Pea Shoots and Bacon. When received pea shoots for the second time, my gut wanted to make this frittata again, because frankly, I was hooked on it’s fluffy egg goodness. But in the spirit of trying something new, I decided to make a pesto. As it turns out, you can make a pesto sauce with just about any green or leafy herb. Now, I’m not sure what the ‘rules’ are and when this vibrant and versatile green sauce stops being a pesto and becomes something else entirely, but for my purposes, herbs and greens pulsed with garlic, hard cheese and olive oil is a pesto. Any other ingredients are just gravy. Along with the Pea Shoots, we also got a spirited bunch of garlic scapes, which I learned were the stems of the hard neck variety of garlic. Basically, they are long, curled green stems with a tear drop shape ‘bud’ at the end. The flavor is a bit more mild than garlic cloves, but can be used in the same ways that you would use garlic bulbs. For instance, in a pesto sauce. So with my pea shoots and garlic scapes, I was already on my way to a pretty unique pesto. I had a block of parmesan in my fridge as well as some of my favorite olive oil. The last question was this: to nut or not to nut? The Baby has a peanut allergy, and with it comes a fairly strict nut restriction in our house. Now, I’ve seen pestos that leave the nuts out completely, and that is definitely one way to go. The problem is, I feel like the nuts add a textural element to the pesto that I would miss greatly if it wasn’t there. 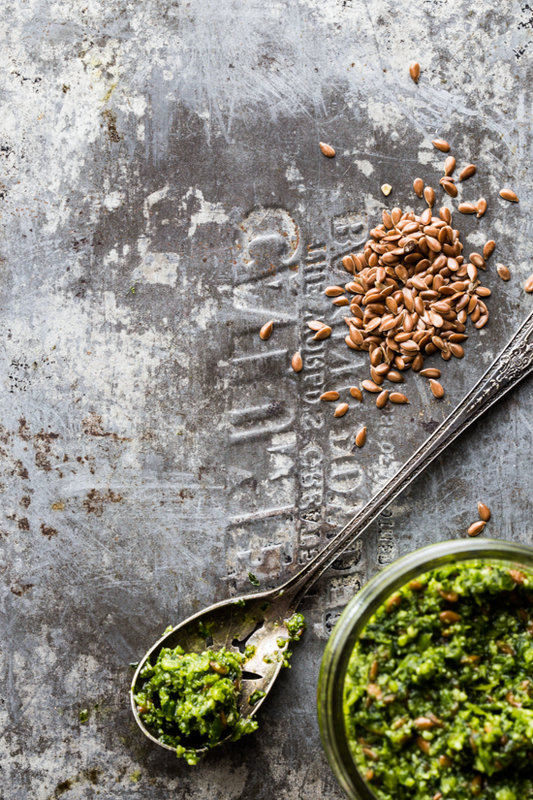 After a quick pantry search, I decided to throw a handful of flax seeds into the pesto to add a bit of crunch and texture. Not to mention some additional health benefit. A few unexpected CSA goodies and a nut substitution and voila – Pesto with Pea Shoots and Garlic Scapes. 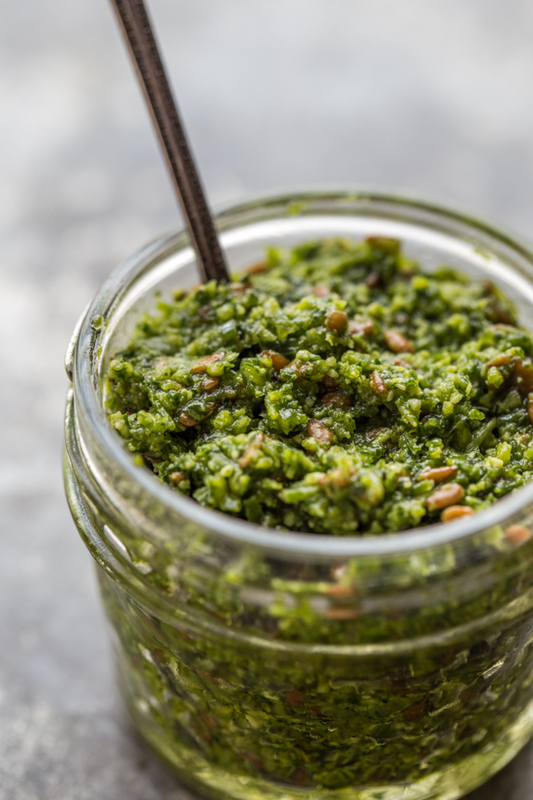 Spread this fresh and tangy pesto on a grilled cheese sandwich or a homemade pizza or toss a bit into some warm whole grain pasta for a quick and simple meal. The thing I love best about this recipe is it’s versatility. Any leafy and flavorful herb or small green can be used in place of the pea shoots. 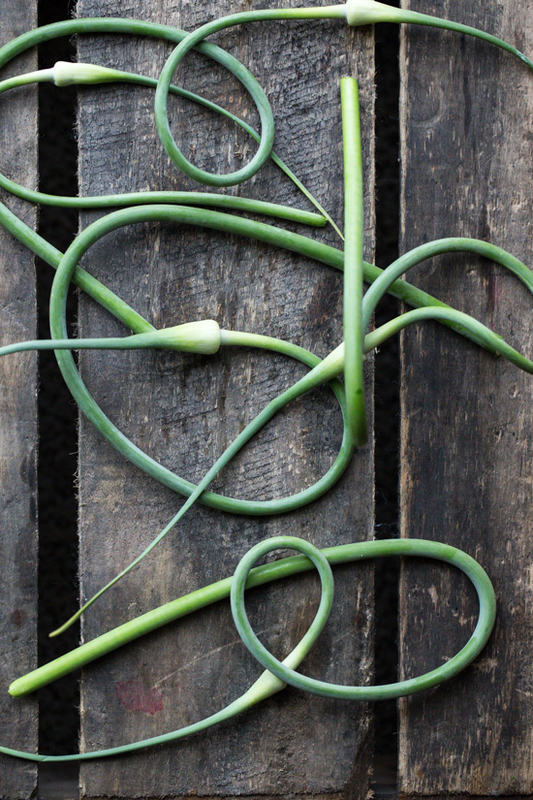 Don’t have garlic scapes? No problem, substitute fresh garlic cloves instead. Experiment and have fun! 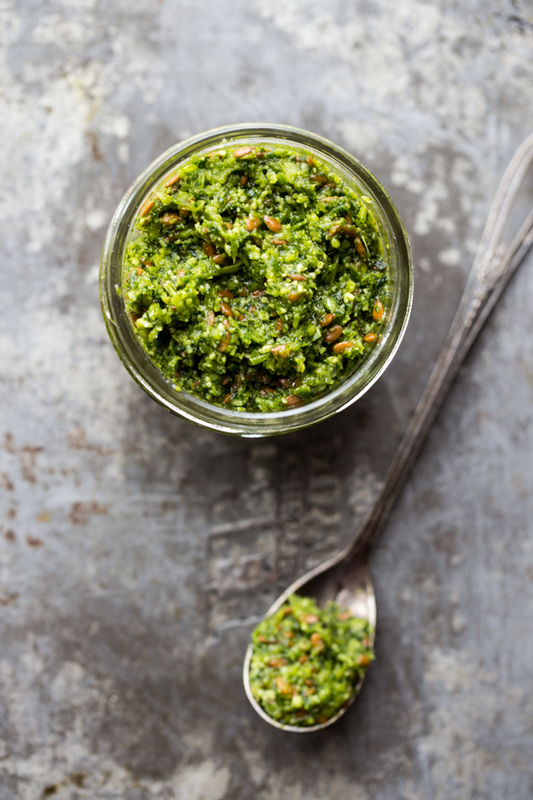 What is your favorite way to make and use pesto? Combine pea shoot leaves, garlic scapes and flax seeds in the bowl of a food processor and pulse until coarsely chopped. With the food processor running, stream in 1/2 cup of olive oil until pesto is your desired consistency. You may need to add up to 1/4 up more olive oil. Stir in cheese and season with salt and pepper to taste. Refrigerate for 1 week or freeze up to 3 months. 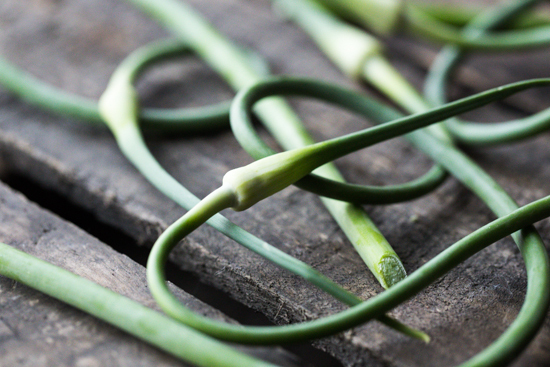 Oh, where were you a few years ago when I had boxes full of garlic scapes and no idea what to do with them?! This is perfect. This is absolutely beautiful!! I had a bad experience making pesto one time and since then have just used a decent store bought variety whenever I need it. Let alone branching out to pea shoots and flax seed!! Thumbs up for creativity. Excited to start following you Emily!